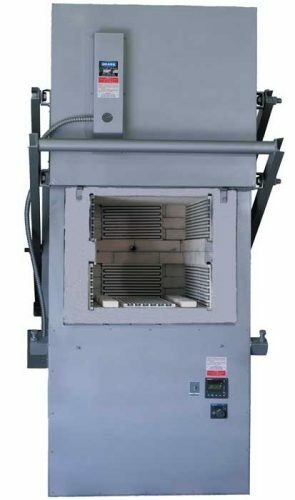 Designed for those who desire a large hardening furnace plus a separate furnace for tempering or drawing, with a small footprint. The two chambers allow for immediate tempering or drawing after quench without waiting for the hardening furnace to cool to the lower temperature required. CONTROLS: Both furnace chambers are equipped with their own Cress Autotuning Microprocessor Based Controls, Chromel-Alumel thermocouples and contractors. A switch is provided to turn off elements when either door is opened. Fan stops when lower door is opened. An independent backup control, with contractor and thermocouple, on each chamber is standard. ELEMENTS: High temperature wire elements are coiled and mounted in easily removable porcelain element plates on each side and bottom of both chambers. Elements are also located on the doors of both furnace chambers. A ceramic hearth plate covers the floor element. Lower furnace chamber is equipped with a stainless steel, centrifugal type fan to circulate the air and provide very close temperature gradients. Fan is operated by a 1 HP motor. Easy access to furnace controls and wiring is provided by removable panel on control cabinet.